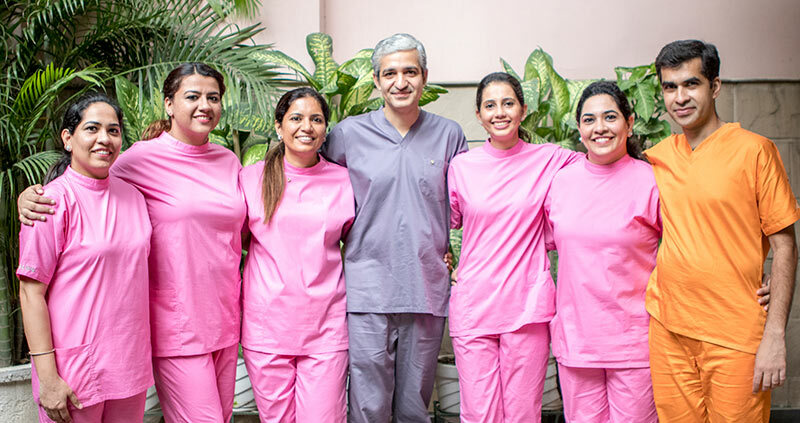 Sterling Dental Clinic is a modern, private dental practice offering world class dental services, consisting the team of multi-specialty dentist, situated in the prime area of Vasant Vihar, in the heart of Delhi. At Sterling, we have imported the latest equipment and are trained to handle all the cutting edge procedures in the dentistry world. When we say, we are the best dentists in Delhi, we mean it. Our panel of dentists have worked at various prestigious clinics like Escorts Heart Institute and Research Centre, All India Institute of Medical Sciences, Sant Parmamand Hospital, Apollo Clinic and Dr. Soni’s Dental Clinic. We are on the panel of The American Embassy, American Embassy School, Egyptian Embassy, French Embassy, German Embassy, Israel Embassy, International S.O.S. and G.D. Goenka World School. We have been serving people from the World Food Programme (UN), diplomats from various embassies and are also recommended by the Delhi Network. Our warm and welcoming lounge has been primarily designed to help you feel as comfortable as possible. Our highly qualified team will provide you professional dental service with a personal touch. We understand that a visit to the dentist may not be your favourite thing to do, but the Sterling Dental Clinic provides an atmosphere where you will feel secure, safe and supported throughout your dental experience. If you are someone who feels very uneasy being in a dental chair, we offer sedation dentistry to make your visit relaxed and calm. The dental team at Sterling are highly trained and skilled professionals who offer a wide range of dental procedures including dental implants, smile makeovers, cosmetic dentistry and teeth whitening. At our clinic, we are committed to continued learning so we can offer patients the latest dental techniques, procedures, equipment and products. We offer all the different aspects of cosmetic dentistry ranging from high quality ceramic crowns and bridge work to gold crowns, porcelain laminates, inlays and tooth coloured fillings, and also a one hour in-office teeth whitening procedure for patients needing a quick fix. The latest is the full mouth rehabilitation with fixed dental implants. We also have the facility for nitrous oxide (laughing gas) and sedation dentistry. At our practice, we are also equipped with OPG X-ray facility (full mouth x-ray) to have an overall view of the patient’s mouth. All of this is guaranteed in a sterile and hygienic environment under the supervision of best dentists in Delhi. We look forward to serving you with our expert team. At Sterling Dental Clinic, we recognise that our patients have busy lives, which is why we offer extended hours as well as keep the clinic open on Saturdays to make visiting us easier. However unhappy you are with your smile, we have the expertise and artistry to give you a total Smile Makeover that will change the way you feel about yourself, forever. You can contact us to schedule an appointment. Whether you need a simple check-up or an advanced restorative treatment, our Sterling Family is here for you. To learn more information about our procedures, do continue to explore our website. Every patient has unique dental requirements and understanding their needs and concerns is key to the high quality of service that we provide. All of our treatments are planned after close consultation with you, and when we recommend something, we strive to deliver with very high and exacting standards. We welcome nervous patients, and our caring team will take the time and patience to talk to you and help you overcome any dental phobias you may have.